Rajshree Overseas is one of the leading Manufacturer, Exporter and Supplier of Stainless Steel Forged Fittings using high quality raw materials. 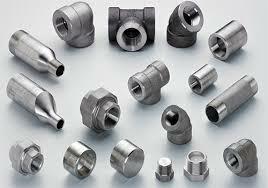 We provide SS Forged Fittings as per the customer specifications and we offer complete range of SS Forged Fittings. Wea are one of the Largest Exporter, Manufacturer and Supplier of Premium Quality Stainless Steel Forged Fittings. With characteristics like unmatched standard and superior grade, our range of product is the finest one obtainable in Mumbai(India). We make available the product range that is as per the customers; exact requirement and needs.